Australian Plants Society NSW - Why grow Australian plants? What is an Australian native plant? An Australian native plant is any plant indigenous to Australia except those identified there as naturalised. An Australian native plant also includes any hybrid or cultivar in which all parents are Australian native plants (ANPSA). Whether you have an established garden or a brand new site, Australian native plants add a powerful ‘sense of place’ to our homes and parks. Australian plants are those which belong to Australia, having evolved over many millions of years in an age-old continent in relative geographic isolation. 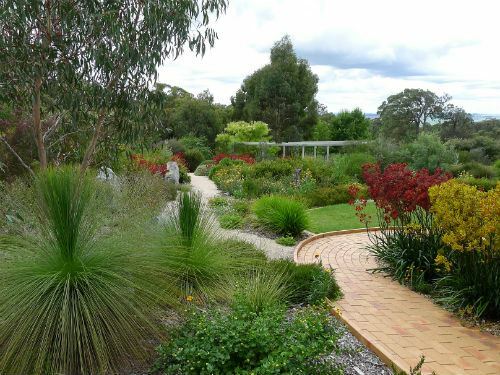 This beautiful native garden in Oberon was created by Fiona Johnson, a member of the Central West Group. They are beautiful and unique. Yes, beauty is in the eye of the beholder, and some plants look prickly and dry. Understanding how plants have evolved to cope with our depleted soils and variable climate brings a new understanding of beauty. Yet there are many stunning Australian plants as shown in our plant database. They are uniquely adapted to our environment. Plants indigenous to NSW (that is, plants for the immediate locality) are ideally suited to the soil, climate and geography. This means more resilience to the vagaries of our weather, soils and bugs and diseases. Many of our District Groups have lists of plants that are uniquely suited to regions within NSW. Many plants from across Australia can grow in NSW. Much of Australia’s flora adapts to other regions. Of course, some plants, like those exquisite Western Australian banksias and boronias are very fussy. We can grow them but it means adjusting the environment. They support biodiversity. Housing, feeding and caring for our population can be hard on the environment and the plants and animals which have lived here for millennia. Planting Australian helps regain the balance and prevents loss of species. We are conserving our unique flora and their habitats for our children and grandchildren. If we don’t care for these plants and where they grow, they’ll be gone. Many of our members grow the plants not just for the beauty and resilience, but to keep them alive for future generations.